YAK? Seriously? Very, very cool. You and your yak are super spiffy. I love the sound of that burger with blue cheese. Would be interesting to use yak but I'm pretty sure we would not have that anywhere in the country! OK, I've never had yak! Honestly, I'm having trouble picturing one. Let me go Google it real quick. Huh. Well alrighty then. Sort of looks like a cross between a cow and a buffalo. I've been subbing venison for beef lately--I'm surprised how well it works! Emu even tastes a lot like beef. Yay for us with our crazy beef stand-ins. You threw me with that yak - and everyone else obviously. If I could find it, I'd try it - but that burger would be great with beef too. 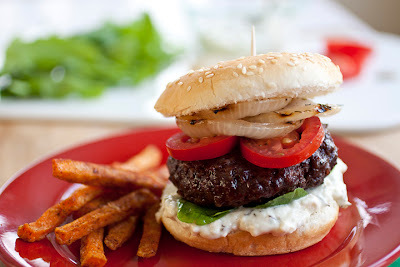 Any burger with blue cheese sounds divine. Haven't commented in a while but love all your posts! This sounds amazing. I don't eat meat very often, but I have been craving a good burger! Hi Laura, I just wanted to say that I tried the candy airplanes with my nieces this past weekend and they LOVED them...and then about 30 seconds later they said "when can we eat them?" :) thanks for sharing. I would love to see more kids craft foods like that! The blue cheese mayo sounds amazing! Thanks for getting the conversation going! Yak is terrific but I would have to say that wouldn't I? If you can find it locally, give it a try, you won't go back!